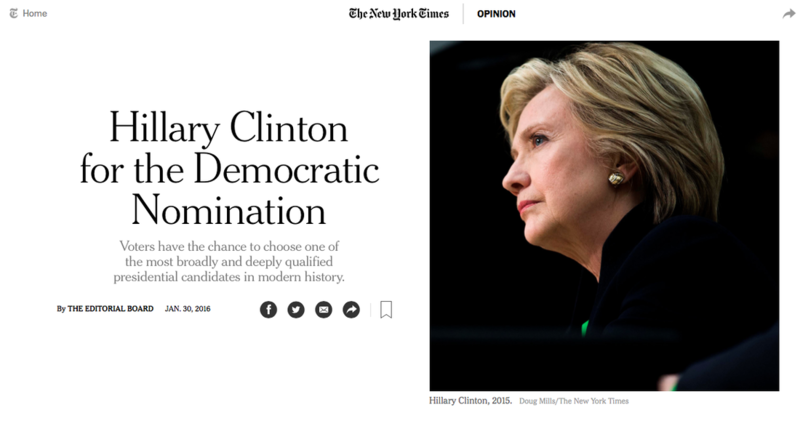 ​Nomination Voters have the chance to choose one of the most broadly and deeply qualified presidential candidates in modern history. Hillary Clinton would be the first woman nominated by a major party. She served as a senator from a major state (New York) and as secretary of state — not to mention her experience on the national stage as first lady with her brilliant and flawed husband, President Bill Clinton. The Times editorial board has endorsed her three times for federal office — twice for Senate and once in the 2008 Democratic presidential primary — and is doing so again with confidence and enthusiasm. The third Democratic contender, Martin O’Malley, is a personable and reasonable liberal who seems more suited for the jobs he has already had — governor of Maryland and mayor of Baltimore — than for president. Mrs. Clinton is a strong advocate of sensible and effective measures to combat the plague of firearms; Mr. Sanders’s record on guns is relatively weak. Her economic proposals for financial reform reflect a deep understanding of the 2010 Dodd-Frank financial reform act, including the ways in which it has fallen short. She supports changes that the country badly needs, like controls on high-frequency trading and stronger curbs on bank speculation in derivatives. Mr. Sanders has scored some rhetorical points against Mrs. Clinton for her longstanding ties to Wall Street, but she has responded well, and it would be comical to watch any of the Republican candidates try to make that case, given that they are all virtually tied to, or actually part of, the business establishment. One of the most attractive parts of Mrs. Clinton’s economic platform is her pledge to support the well-being and rights of working Americans. Her lifelong fight for women bolsters her credibility in this area, since so many of the problems with labor law hit women the hardest, including those involving child care, paid sick leave, unstable schedules and low wages for tipped workers. Mrs. Clinton is keenly aware of the wage gap for women, especially for women of color. It’s not just that she’s done her homework — Mrs. Clinton has done her homework on pretty much any subject you’d care to name. Her knowledge comes from a commitment to issues like reproductive rights that is decades old. She was well ahead of Mr. Sanders in calling for repeal of the Hyde Amendment, which severely limits federal money to pay for abortions for poor women. As secretary of state, Mrs. Clinton worked tirelessly, and with important successes, for the nation’s benefit. She was the secretary President Obama needed and wanted: someone who knew leaders around the world, who brought star power as well as expertise to the table. The combination of a new president who talked about inclusiveness and a chief diplomat who had been his rival but shared his vision allowed the United States to repair relations around the world that had been completely trashed by the previous administration. Mrs. Clinton helped make it possible to impose tougher sanctions on Iran, which in turn led to the important nuclear deal now going into effect. She also fostered closer cooperation with Asian countries. She worked to expand and deepen the dialogue with China and to increase Washington’s institutional ties to the region. Mrs. Clinton had rebuked China when she was first lady for its treatment of women, and she criticized the Beijing government’s record on human rights even as she worked to improve relations. In January 2011, before the Arab Spring, Mrs. Clinton delivered a speech that criticized Arab leaders, saying their countries risked “sinking into the sand” unless they liberalized their political systems and cleaned up their economies. Certainly, the Israeli-Palestinian crisis deepened during her tenure, but she did not cause that. Mrs. Clinton can be more hawkish on the use of military power than Mr. Obama, as shown by her current call for a no-fly zone in Syria and her earlier support for arming and training Syrian rebels. We are not convinced that a no-fly zone is the right approach in Syria, but we have no doubt that Mrs. Clinton would use American military power effectively and with infinitely more care and wisdom than any of the leading Republican contenders. Mrs. Clinton, who has been accused of flip-flopping on trade, has shown a refreshing willingness to learn and to explain, as she has in detail, why she changed her mind on trade agreements like the Trans-Pacific Partnership. She is likely to do more to help workers displaced by the forces of trade than previous presidents have done, and certainly more than any of the Republicans. Mrs. Clinton has honed a steeliness that will serve her well in negotiating with a difficult Congress on critically important issues like climate change. It will also help her weather what are certain to be more attacks from Republicans and, should she win the White House, the possibility of the same ideological opposition and personal animus that President Obama has endured. Some of the campaign attacks are outrageous, like Donald Trump’s efforts to bring up Bill Clinton’s marital infidelity. Some, like those about Mrs. Clinton's use of a private email server, are legitimate and deserve forthright answers. Hillary Clinton is the right choice for the Democrats to present a vision for America that is radically different from the one that leading Republican candidates offer — a vision in which middle-class Americans have a real shot at prosperity, women’s rights are enhanced, undocumented immigrants are given a chance at legitimacy, international alliances are nurtured and the country is kept safe.